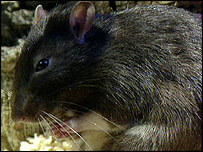 It's World Rat Day, a chance for rat owners globally to celebrate their rather maligned and misunderstood pets. They're not considered your average pet but there are 2.5 million rodent-owning households in Britain, according to the Pet Food Manufacturers' Association. That's quite a lot when you consider there are just over five million dog-owning households in the UK and the British are famous for being a nation of dog lovers. World Rat Day is a chance for rat owners to celebrate their pets, an opportunity they don't often get. "There is a stigma attached to owning a rat," says Stella Hulott, who runs the Kent-based charity and rat shelter, CavyRescue (which is staging a rat beauty pageant for the occasion). "Often teenage owners are more open about their choice of pet but I have a lot of friends who are older and professionals and they tend to keep quiet as people often assume you have a dirty home or are a bit odd." According to enthusiasts, rats make far better pets for young children than other more traditional domesticated creatures, like rabbits. Their qualities include liking human company, being very intelligent and clean, despite the common misconception that they are dirty, disease-spreading vermin. "They spend 40% of their time cleaning themselves but they are wrongly associated with dirt and squalor," says Mrs Hulott. "Another major misconception is that they attack you and go for your throat, but a pet rat is as different from a wild rat as a dog is from a wolf. "It's like a small child going up to a 20-stone man and saying 'come on then', it just doesn't happen." Mrs Hulott and her husband Jason set up their charity to educate people about rats and run a recycle-a-rodent scheme to re-house homeless domestic rats, along with other small furry animals. They hope to expand and open a rat sanctuary that is staffed 24-hours-a-day. Caron Clayton first bought a rat for her teenage son two years ago. She admits she was apprehensive at the time, but now considers Bubbles part of the family. "Rats are adorable and such good company," she says. "I viewed them the same way as most people before my son pestered me into getting him one, it was their tails that particularly put me off. Bubbles soon changed my opinion and I would now recommend them to anyone as a pet. "Bubbles really enjoys interacting with people and is very intelligent, he learned to recognise his name really quickly and has been taught tricks. My favourite time is when he settles on my lap in the evening and we watch television together." The aim of World Rat Day is to win back some respect for rats through positive promotion. CavyRescue is launching a rat beauty pageant as part of its celebrations. People can send in and judge pictures on the charity's website. The winner will get a luxury rat home worth £80. Caron Clayton intends a more low-key celebration and will be giving Bubbles some non-sugared breakfast cereal as a special treat. We have 5 rats - two old rescues, two from a breeder and one from an acquiantance's accidental litter. They're surprisingly sociable pets; friendly, playful, attention-seeking and able to learn lots of neat tricks! They hardly smell (in comparison to many other rodents) and are easily litter trained, thus very clean - what more could one want from a pet? When my sister first got pet rats I was horrified but I have come to quite like them. They are excellent pets for her children and even I am rather fond of them now. They are very intelligent creatures and affectionate. I own three pet rats, and I can honestly say they're the best pets you could ever want! People often say "eeugh" when I mention my pets, and it's incredibly frustrating that such an amazing animal has such a terrible reputation. A rat is a rat, they are vermin and they should be destroyed! I love rats and have done for years. I've currently got 8 and they are all definitely members of our family. They make excellent pets, especially for children, as they will put up with a lot more mis-handling than some of the more 'traditional' childs pets such as hamsters. They should be kept in at least pairs, need large cages, specialist diets and a lot of time and love, but will reward you with fun, love and loyalty almost on an equal to a dog. At last - a recognition of the softer side of our favourite pets... We've had 3 rats for 2 years now, and have never even been slightly nibbled by them - unlike my hamster which bit me so much that it used to draw blood! My daughter had guinea pigs. I don't think domestic rats are much different. I think it's the tails that put people off. Once your colleagues find out you own rats ¿ that¿s it. You are an easy target. Unfortunately for my colleagues I am an aggressive ex Rugby player, who takes great pleasure in annihilating, unsuspecting, ignorant workers who decide to pass comment on me. They never do it again I assure you. Rats make great pets and they sleep during the day while you are at work, haven't quite trained mine to do the washing up though! Peoples perceptions are a funny thing. Whilst wandering about our local town in my youth, white ratty on shoulder, people would come up to me and coo silly questions, like "aww cute is it a ferret?(!)". On my reply of "rat" their smiles would freeze into disgust and their feet usually run away..
Pet rats are the most beautiful, intelligent and funny animals you could ever own. I couldn't imagine life without my two boys now, and am on the lookout for more rats to keep them company. Personally I do not really see the difference between having a hamster or having a rat. Yet hamsters are much more 'acceptable' despite hamsters being much more vicious animals than rats are. RE Mark Scott -Bells comment about rats are rats. In the same light, how do you feel about being classed as the same as 'all the others' by overseas persons? The same, no? I have 2 rats and after my dog they are the best pets I've ever had. I've owned rabbits gerbils and hamsters and the rats are the best! They are cleaner, and love to be petted where rabbits and hamsters tend to want to run away. P.S any one named Mark Scott-Bell needs to be destroyed! Well, in response to Mark, does that mean racing pigeons should be destroyed, because pigeons are dirty/vermin (and carry more diseases communicable to humans than rats do)? I've had rats for 13 years - mostly in pairs, but the occasional trio - and they are marvellous. I'd recommend them to anyone, and nobody who has met them has failed to be converted! My parents raised me with pet rats and they are, by far, the most intellectual animals that I have had the privilege of near. Pet rats have about as much in common with wild rats as say, dogs do to dingos or wolves! I had a pair of pet rats a few years ago and they were really great pets - very intelligent and always cleaning and grooming themselves. 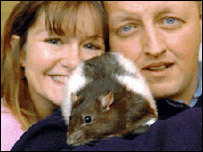 If people such as Mr Scott-Bell of Plymouth could just get over this silly rat-phobia, perhaps they would see what excellent pets fancy rats are.